American BLS+ | Free CPR Classes and CPR/BLS Certification Online. Would you be able to help your child, spouse, parent, or co-worker survive a heart attack? Not without some form of CPR training. Calling 9-1-1 is a great start but with less than 10 minutes until death, you’d better begin CPR or the victim will die. Our CPR classes online are a great way to learn CPR or refresh your knowledge in Basic Life Support (BLS). This website has been developed by the licensed instructors at American BLS and is designed to teach you CPR through an easy online interface. All American BLS courses meet or exceed the latest guidelines and have been updated for 2019. The course is absolutely free and there is no need to ever purchase anything. If after taking the course, you wish to get certified, simply take the CPR test and receive your diploma and wallet card for only $18.95. Otherwise, take the free course and keep the knowledge with you at no cost. 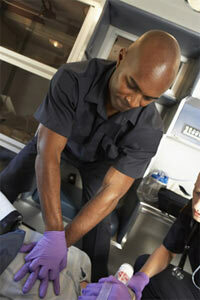 American BLS offers online training courses in CPR, AED, First Aid & Bloodborne Pathogens. ✓ Register with American BLS. ✓ Take one of the Free Classes and learn how to save lives. ✓ Take the CPR Certification Test (Optional). ✓ Get your official certification with wallet card for only $18.95 (Optional). For the professional, there are certification options available. You must complete the online training course and pass the assessment quiz to receive your certification. Certification includes a printable certificate and wallet card as well as a hard-copy wallet card signed by the instructor and mailed to you within the next business day. There is a fee for certification but there is no cost to take one of our online CPR courses. CPR Certification lasts for 2 years and can be renewed at your convenience. Our CPR classes online allow you to learn CPR, BLS, and other lifesaving techniques in the comfort of your own home. There is no need to drive to a 2 hour long course and waste your day. And best of all, our online courses are Free. Learn the lifesaving BLS skills and be confident in your ability to act in an emergency. Our courses use a combination of text, pictures, animations, and video. Receive your BLS certification online in a couple hours with our comprehensive online training system. All our online BLS classes maintain the latest guidelines and are updated as the guidelines change. We offer a BLS Course, a First Aid Course, and a Bloodborne Pathogens Course.